Just as Paul Hogan and Steve Irwin let their True Blue personalities charm the world, an 11-year-old Aussie girl surfer is now tearing it up. Sydney’s Sabre Norris’ unforgettable interview with Australian breakfast show Today went viral and even caught the attention of Ellen Degeneres. Sabre was invited onto the popular US television host’s show and backed up her first interview superbly. As the youngest surfer to compete in the Sydney International Women’s Pro competition event in November, there is no doubt Sabre is a star destined for great things. But it was her hilarious interview with Today that really grabbed the world’s attention. 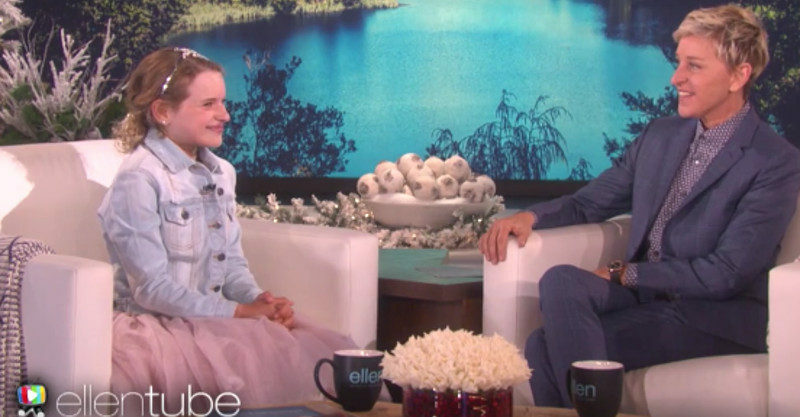 Proving what you see and hear is what you get, Sabre excitedly shared her love of food with Ellen in an interview watched more than 16 million times. The young surfer explained how she would use her $500 prize money for coming 25th in the November competition to satisfy her sweet tooth. “I wanted to spend it all on doughnuts but my favourite doughnut place, Doughnut Time, actually gave us them for free,” she says. “So I still have $500 left so I gave $100 to my sister, $100 to my brother and $100 to my other sister and so I have $200 left to spend. “I brang my money here (US) and I found this big Hershey Kiss, it’s as big as my head, so I am going to spend it on that (SIC). Sabre revealed her love of food was even a great motivator behind her goal to win a world title in surfing. “I would die to go to Las Vegas, I would give you my left arm, because I did research about this place and there must be a buffet in every single hotel – like you can get Krispy Kremes for breakfast and lava cake for breakfast and crab legs for breakfast,” she says. Thankfully, Sabre didn’t have to wait too long to achieve her food dream as Ellen surprised her with a Las Vegas trip complete with accommodation at Planet Hollywood, Justin Bieber tickets and $500 spending money.